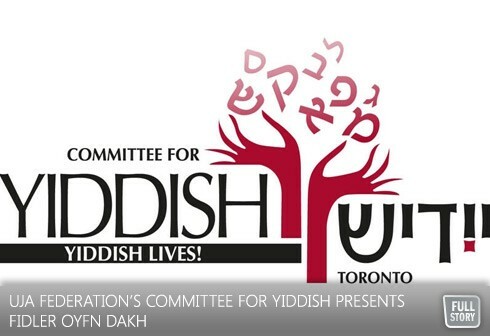 By Daniel Koren--Made up by volunteers who share a common love and affinity for all-things Yiddish, UJA Federation of Greater Toronto’s Committee for Yiddish has been making an impact on Toronto’s Jewish community since the early 1960s, fostering a love of Yiddish through language, the arts, and other venues. And how better to appeal to a broader audience than to offer a theatre workshop centered on reading the Yiddish-language version in transliteration of Fiddler on the Roof (Fidler Oyfn Dakh), arguably the most popular and successful Jewish musical ever made. That’s right. Participants of the ten-week workshop - made possible with the support of the J.B. and Dora Salsberg Fund at the Jewish Foundation of Greater Toronto - will be under the guidance of Gemini-award winning Canadian actor, director and performer, David Gale (Loving Spoonfuls, Chutzpah a Go-Go). No experience in theatre or Yiddish is required, just a love for drama, comedy and the Jewish language. Committee member Eda Zimler-Schiff claims the inspiration for the workshop came after Yiddish theatre groups in Montreal and New York were expanding. “Yiddish is part of our DNA, our tradition, our heritage,” states Chairman of the Committee for Yiddish, Mark Egit. UJA Federation’s Committee for Yiddish also offers Yiddish language classes for adults, children and even pre-schoolers and a reading circle. It has built a strong presence in Toronto by networking with other communities and organizations. They’ve helped establish a Yiddish Studies Program at University of Toronto, sponsor Yiddish classes at York University, offer, and play an important role in Holocaust Education Week, Toronto Jewish Film Festival, Ashkenaz Festival, and the Jewish Book Festival. Fiddler on the Roof, a Yiddish Theatre Workshop, begins October 15 and will take place on Tuesdays and Thursdays at the Workman’s Circle, 471 Lawrence Ave W. To register please call: 416.635.2883 ext. 5189 or email at committeeforyiddish@ujafed.org.